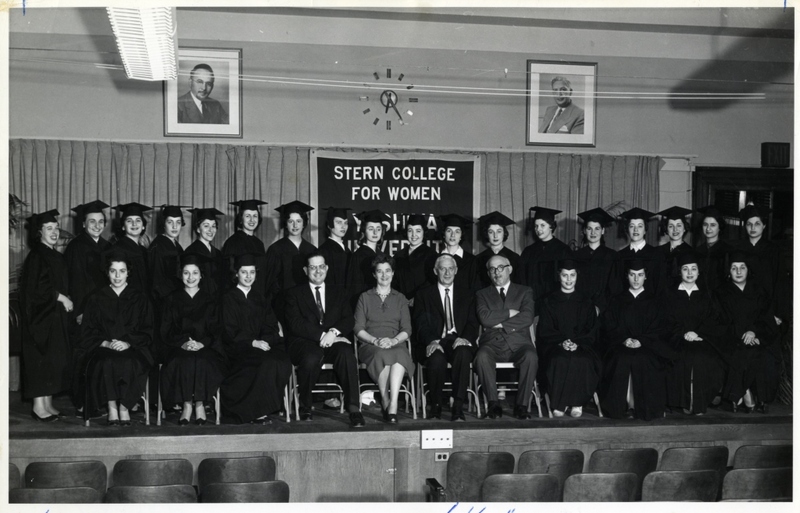 On May 9, 1958, Mayor Robert F. Wagner proclaimed “Stern College Month,” a month of celebration in honor of the first commencement of Stern College for Women. 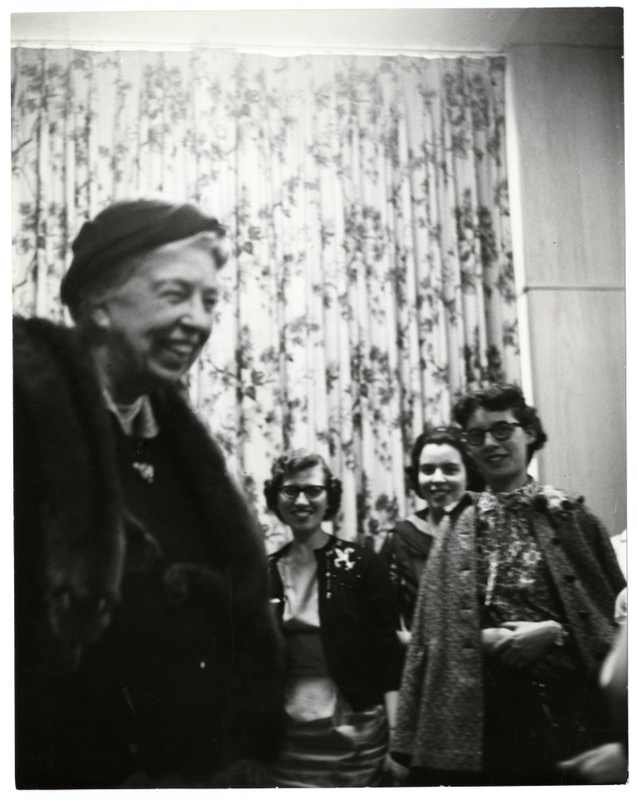 One of the highlight of the month was Eleanor Roosevelt’s fireside chat with the women of Stern College on May 22, 1958. 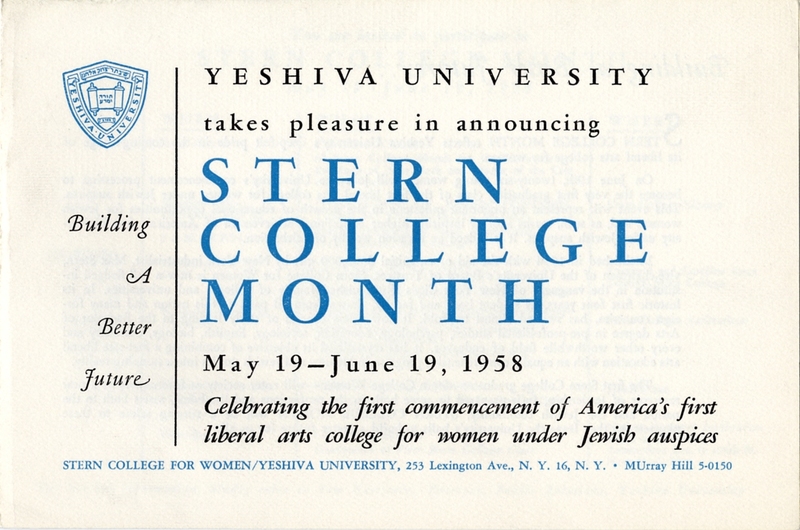 The booklet was described on its title page as “A symposium issued on the occasion of the First Commencement of Stern College for Women of Yeshiva University.” It was distributed at the Stern College dinner, held in honor of Max Stern and the graduating class on June 18, a day before graduation, as part of Stern College month. Among the dinner speakers were Rabbi Dr. Samuel Belkin, President of Yeshiva University, and Herman Wouk, author of the recently published novel Marjorie Morningstar. 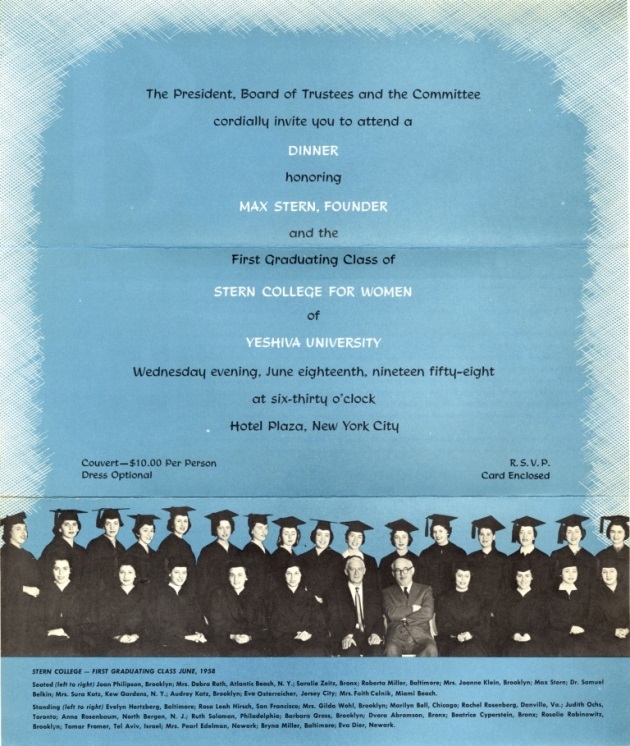 Max Stern was a towering figure in Jewish education in America. 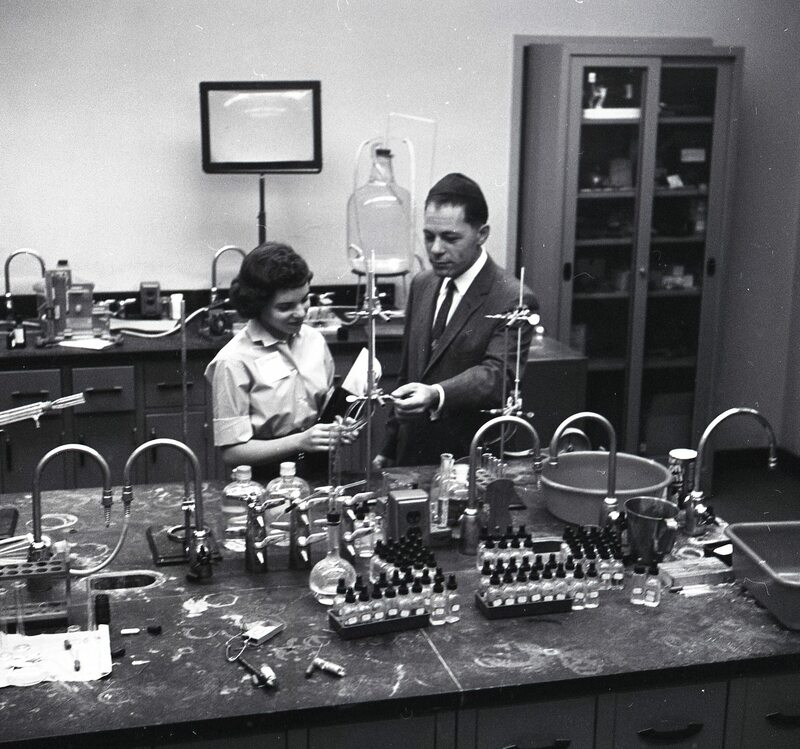 Stern, born in Germany, came to the United States in 1926 and started Hartz, a pet food company. 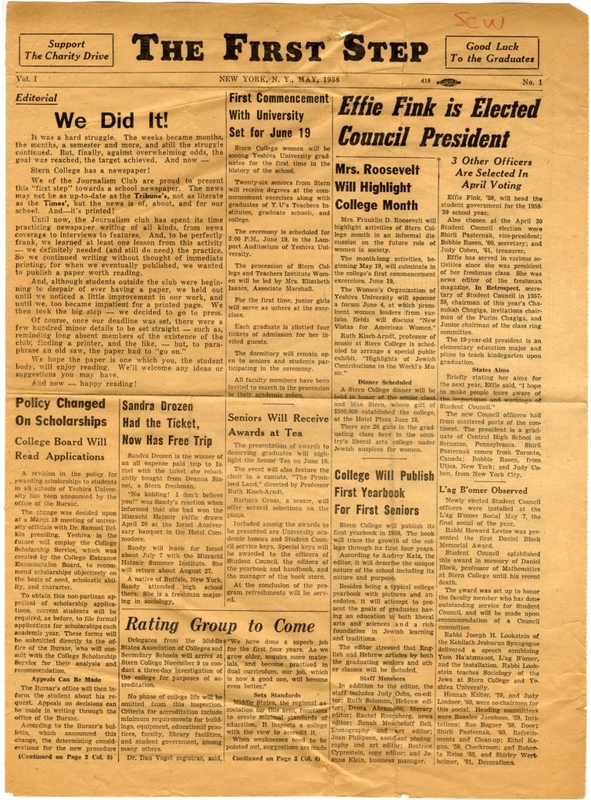 He also became involved in Jewish education and philanthropy. 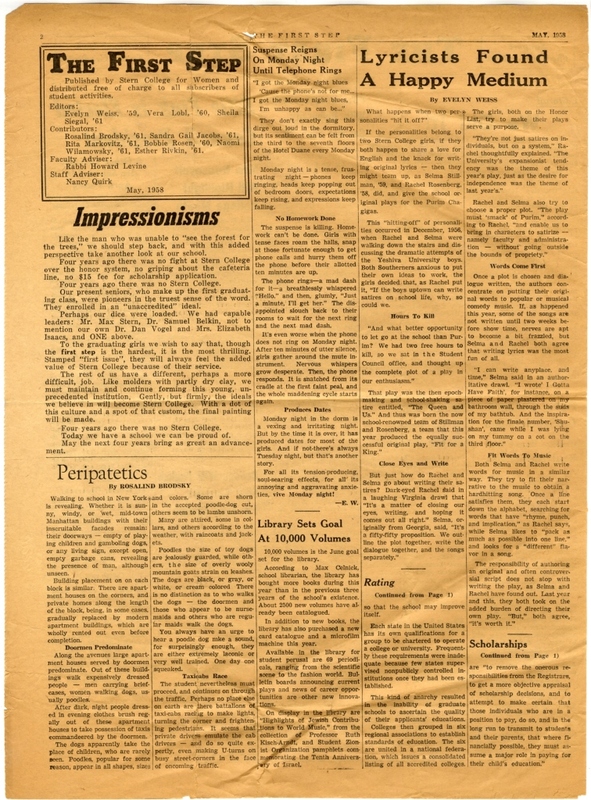 A profile on Stern in the New York Post (December 16, 1964) quoted him: “’I always believed,’ he said, ‘that education, in particular religious education, is the only way to build a better world and an everlasting peace.’” Stern acted on his beliefs; he was president of the Hebrew Teachers Training School for Girls, founded by the Union of Orthodox Jewish Congregations in 1926; he presided over its transformation into the Teachers Institute for Women and its merger with Yeshiva University in 1952. 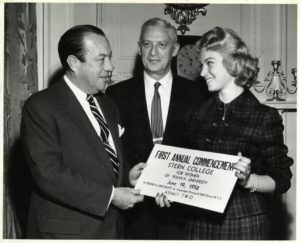 As Vice-Chairman of the University’s board of trustees, he donated $500,000 in 1954 to establish Stern College for Women, named in memory of his parents, Emanuel and Caroline Stern. 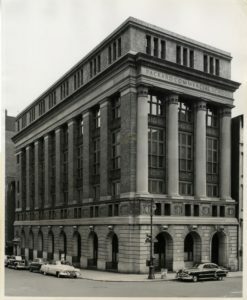 The gift helped purchase the 1911 building of the former Packard Commercial School, on Lexington Avenue and 35th Street in Manhattan, for the new college. 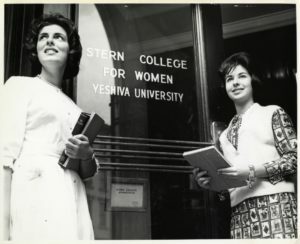 Yeshiva University had taken its first steps in the education of Jewish women when it opened the Central Yeshiva High School for Girls in Brooklyn in 1948 (renamed Yeshiva University High School for Girls – Brooklyn in 1957); the founding of Stern College was a natural continuation of the girls high school, much as the Manhattan Talmudical Academy, established in 1916, was the progenitor of Yeshiva College which opened in 1928. The primary interest of Stern College for Women is to provide young women with an education in liberal arts and science and at the same time a rich grounding in Jewish learning and traditions. With a curriculum emphasizing the importance of the humanities, the program of the College is designed to meet realistically the goals of today’s young woman for intelligent citizenship, cultural appreciation, preparation for a career and graduate study, and management of a Jewish home and family. The academic programs lead to the degrees of Bachelor of Arts (B.A.) or Bachelor of Religious Education (B.R.E.). To those who can qualify, a Hebrew Teacher’s Diploma may be granted. The Jewish woman throughout history has contributed immeasurably to the welfare of our people. 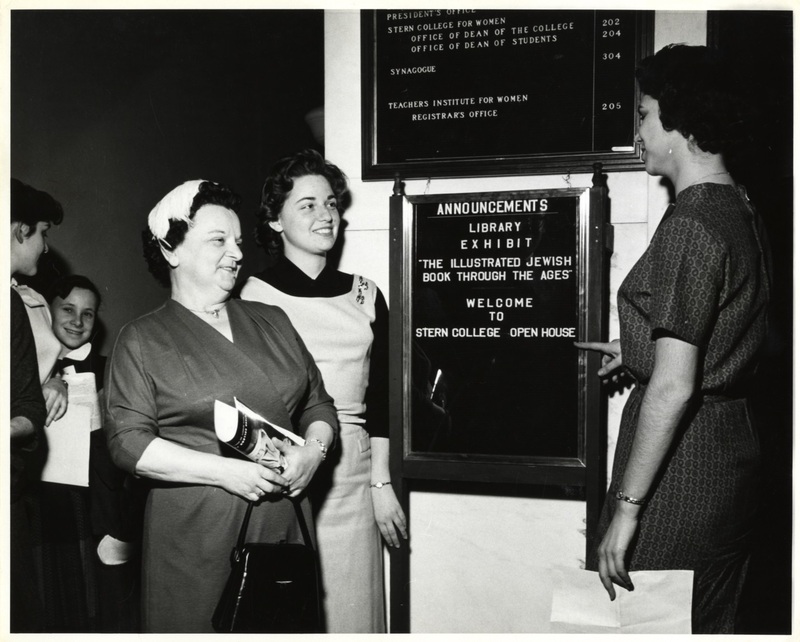 Traditionally, she has been the first teacher of our youth, introducing them to the vast treasures of Jewish culture. Hers has been the responsibility of imbuing the home with the spirit of Godliness that is the sole foundation for a truly moral life. Because of her immense influence for good, the home has been characterized as a major sanctuary of our faith. Thus the Jewish woman has made possible the continuation of our sacred heritage down through the ages. With the coming of modern times, a new dimension of experience was added to the life of the Jewish woman. Now she could play a vital role in the general community, utilizing her special insights in an ever-widening area of activities. Law, medicine, the physical sciences . . . these and many other fields offered her untold opportunities for personal fulfillment and professional advancement. This occurrence brought the need for a special kind of education. 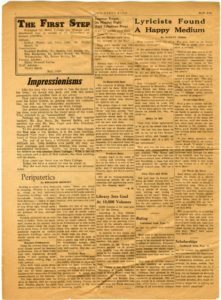 Neither the religious training alone, usually acquired in the home, nor the usual general schooling could adequately prepare the Jewish woman for her new position. Rather, a unique harmonizing of the two was required. 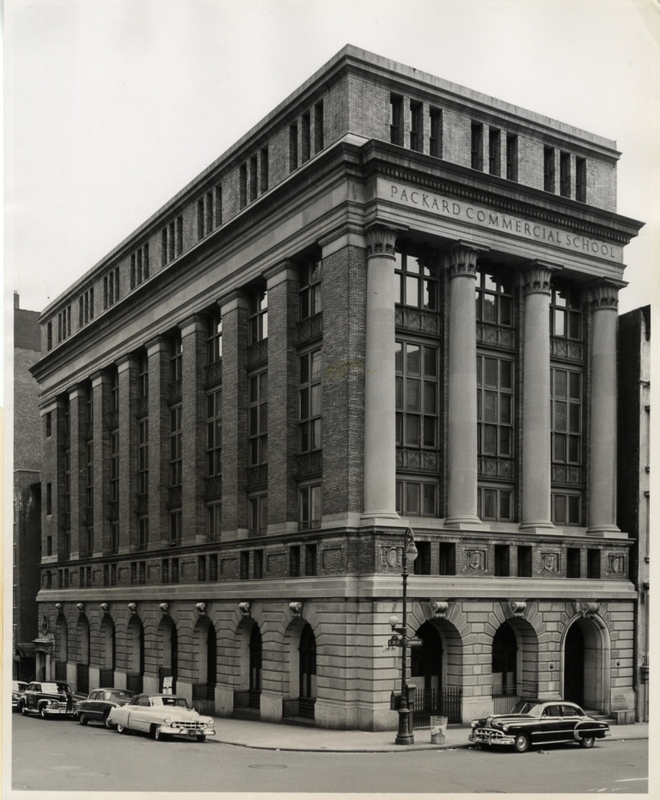 It was to make available this new kind of education that Stern College was established. Here the arts and sciences of the western world are perpetuated together with the time-honored practices and teachings of Judaism. 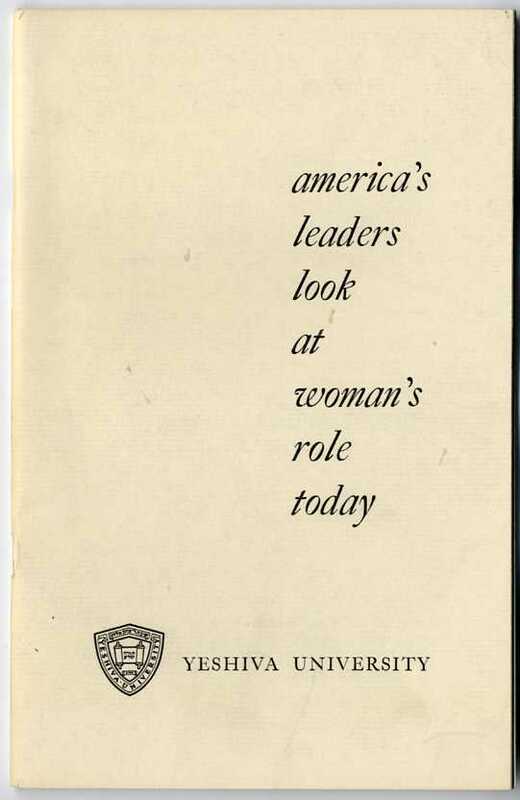 Here the modern woman can devote herself to the complete development of her capabilities as a Jewess and as a student of western culture. You who have benefited from this comprehensive training bear the obligation of carrying on the traditions of Torah even as you enter into your various chosen profession. I trust that you will meet this challenge with distinction, dedicating yourselves to a lifetime of service to the Jewish community and all humanity. 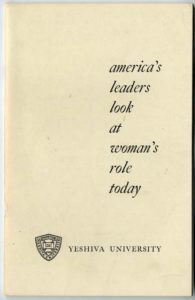 Neither Dr. Belkin nor the authors in “America’s Leaders Look at Woman’s Role Today” addressed a role for women in Judaism or Jewish life other than in the home, as teachers – presumably elementary or high school – or as Jewish communal workers or volunteers. The importance of the role of women and mothers in raising and educating Jewish children was depicted as a time-honored exalted position, a role of utmost importance; Judaism had never kept women back; it was the outside world which had limited their horizons, and the modern innovation of the 1950s was that now the great-wide world finally offered professional training and new vistas and opportunities for women. 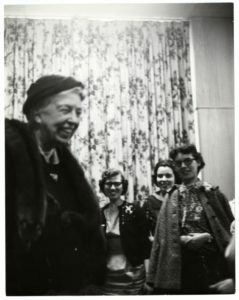 How women and families would integrate and combine the two was one of the questions of the day, and a dilemma the Stern College women raised with Mrs. Roosevelt during the fireside chat. 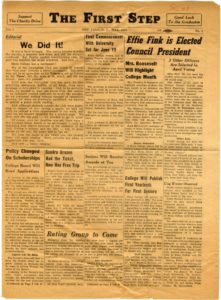 Mrs. Roosevelt’s opinion was that it was a joint venture; if there was complete cooperation and agreement between the couple, and the situation was well thought out, women could successfully work outside the home and raise a family; it could be to the benefit of the parents and the children. 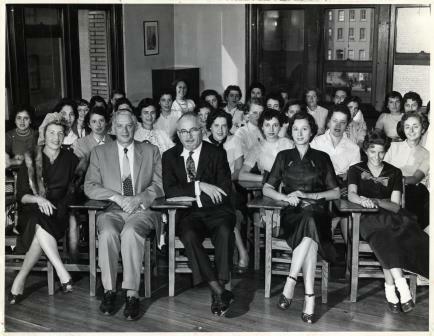 A review of school brochures and catalogs illuminate the statement that Talmud study “has long been an option.” In the 1940s, the Hebrew Teachers Training School for Girls brochure listed Rabbi Solomon Wind as an instructor in Bible and Talmud. 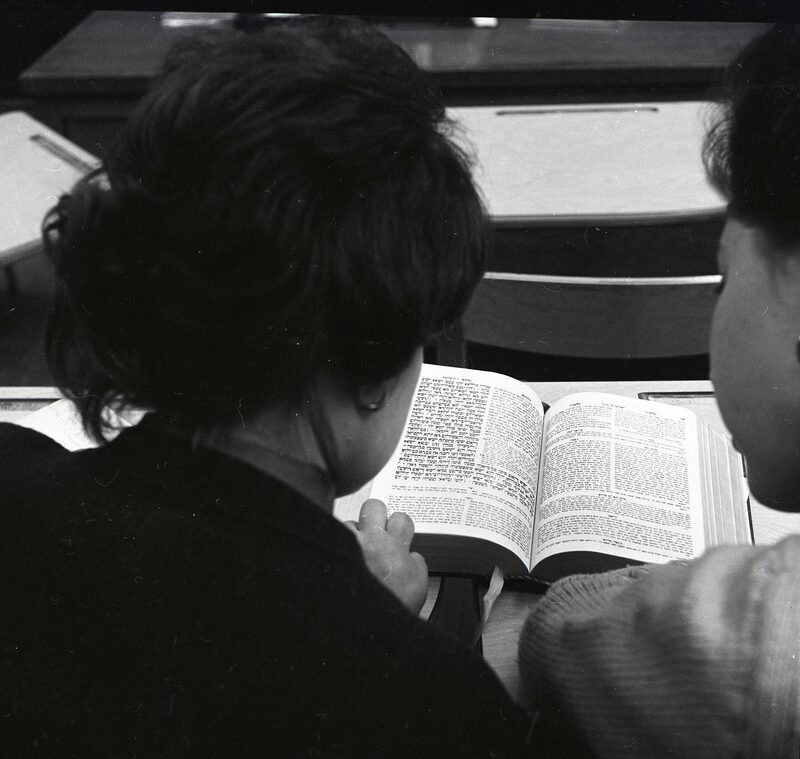 In 1955 through 1957, Stern College offered courses called “Talmudic Literature I-IV;” in the 1960s through the early 1970s a student could study “Talmud: Advanced Selections from Seder Nezikin” and selections from tractates Nashim and Moed. 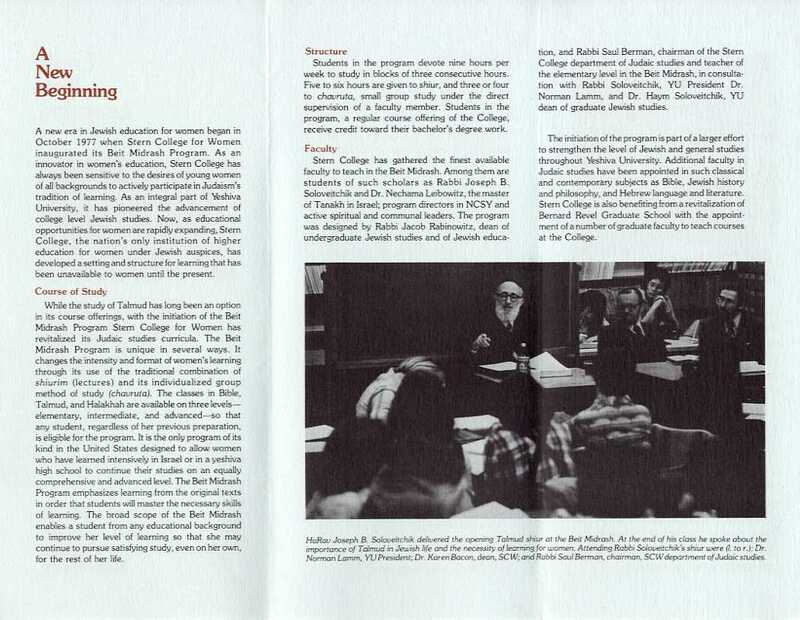 In the 1970s, Stern course catalogs list: “Introduction to Talmudic Literature,” “Development of Jewish Law (Talmud),” and “Talmud 2” taught by Dr. [Isaac] Suna and Rabbi [Melech] Schachter. Talmud study at Stern has grown – albeit in fits and starts – since the introduction of the Beit Midrash program in 1977; for more information on Rav Soloveitchik’s shiur and the Talmud program post 1977 at Stern College, see the articles in Lehrhaus by Rabbi Saul Berman and Rabbi Dr. Zev Eleff, as well as responses to the articles. 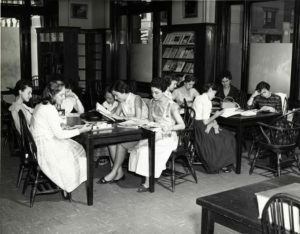 Today Talmud studies flourish: in 2000 Stern College introduced the Graduate Program in Advanced Talmudic Studies (GPATS), a two-year master’s degree program and for women in biblical and Talmudic interpretation. Thus the daughters of the class of ’58 had the opportunity to study in the Beit Midrash in 1977, and their daughters and granddaughters can study Talmud at an advanced level in Stern and at GPATS. 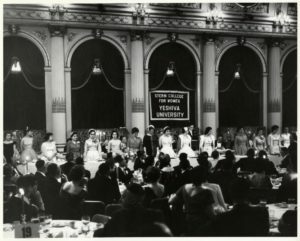 The twenty-six graduates of 1958 were pioneers who braved an uncharted path in a new college and an experiment in Jewish education. 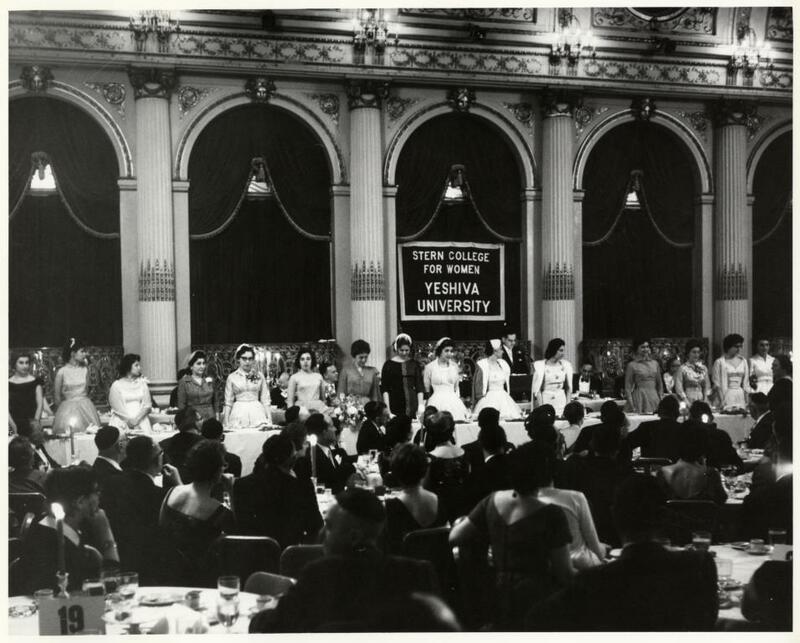 The class boasted an international flavor; of the twenty-six graduates, two students were born in Israel [pre-State], two in Poland, and one in Austria. 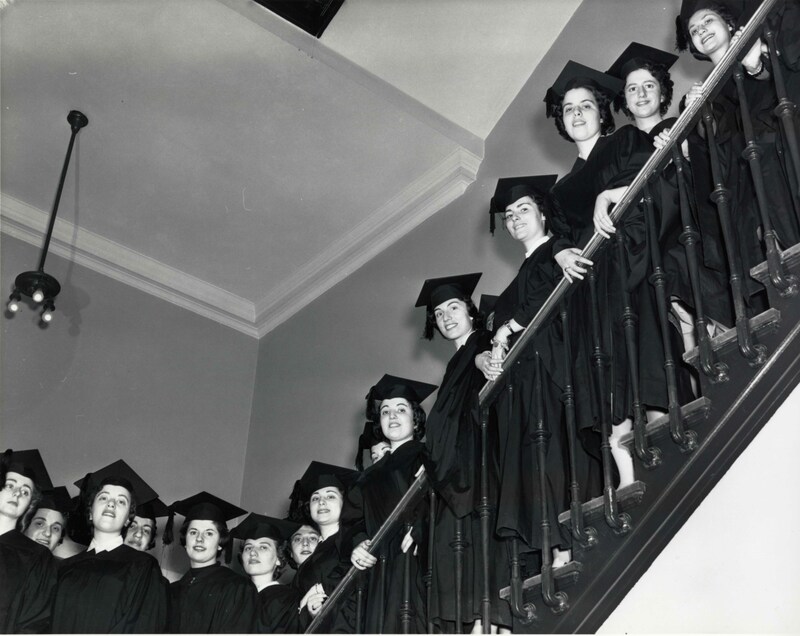 At commencement in 1958, all twenty-six received B.A. degrees, and five were simultaneously awarded a Bachelor of Religious Education degree and a Hebrew Teacher’s Diploma. 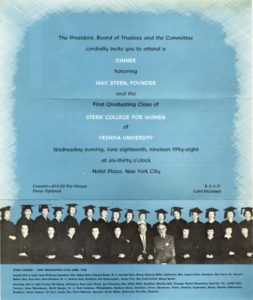 A side note of interest is that the 1958 commencement program lists a Master of Religious Education degree awarded to a woman, Nanette Ellenberg, under the auspices of the Bernard Revel Graduate School. 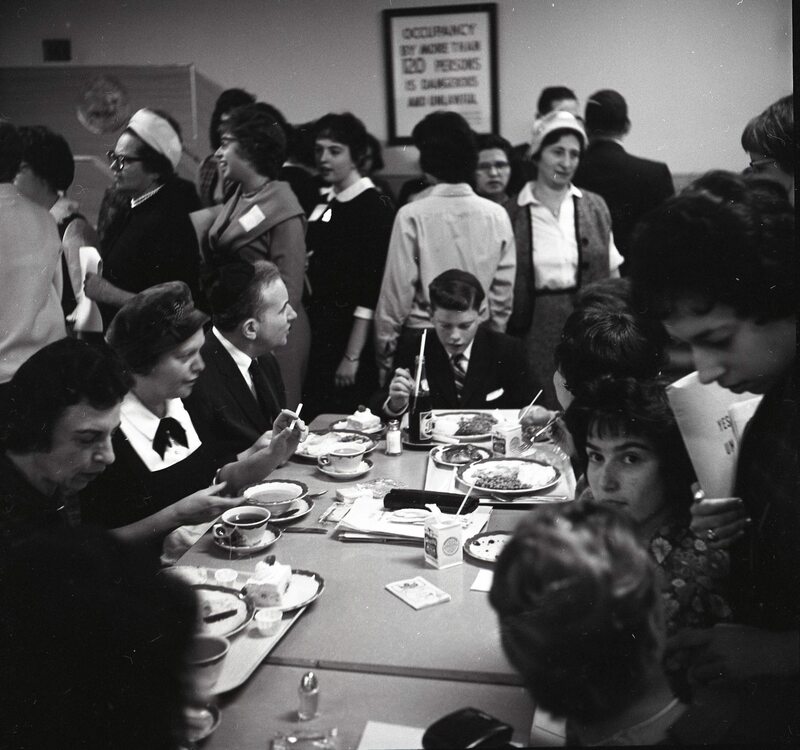 By 1958, when the first incoming class graduated, the College had grown to 170 students. 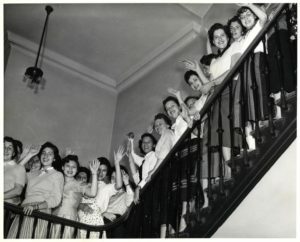 The young women had shared many varied experiences during their four years together, from the excitement of the fireside chat with Mrs. Roosevelt, with its camaraderie and mixture of serious discussion with laughter, to attending the opera in Max Stern’s box and enjoying his home hospitality, to the somber gathering on “the afternoon in 1956 when the entire school sang psalms at a mass prayer meeting for Israel at the outbreak of the Sinai campaign.” These occasions forged bonds among the early Stern College students, many of which last until today. 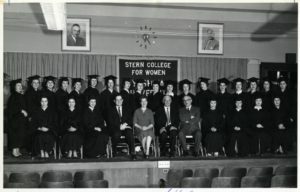 Indeed, the College now boasts legacy alumni, several generations of the same family who have attended Stern College. Stern College has been, and continues to be, a formative force in the life of many Orthodox Jewish women, and thus has helped shape the face of modern Orthodoxy in America today.